After reading a number of glowing reviews, the latest of which being Sarah's at Feeling Fictional, I finally broke down and placed an order through Amazon UK. (There will be a few more UK books reviewed on this site, as I figured that if I'm already paying for shipping, I might as well get a few more!) And I am so glad I did! This was a great book. I've mentioned this before, but I am adopted and love reading about well-written adopted characters. 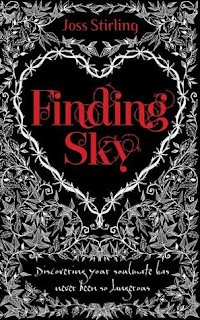 Though I was a little disappointed with Sky's parents, Sky herself is an honest portrayal of a wounded, adopted child who is still working through her memories of abuse and abandonment. I was lucky enough not to have to go through any of that, but I have a friend who did, and Sky's personality and actions perfectly mirrored those of that friend. Kudos to Joss Stirling for tacking such a difficult subject with aplomb. One of my favorite quotes came right in the beginning of the book. "I'd seen plenty of films about American schools and was feeling more than a little insecure about my new place of education . . . I'd never fit in if the movies turned out to be true." That was exactly how I felt on my first day of high school! Thankfully, a lot of kids were just as nerdy, if not more so, than I was. I also loved Sky's neighbor, Mrs. Hoffman, who is described as "not requir[ing] anyone else to participate in her conversations." She reminded me of my favorite Brit - my nan, who is a hairdresser and can talk incessantly for hours. Ironically, a page later she is described as being not very British, but it still made my day! It was refreshing to read a book wherein the main female protagonist does not immediately fall head over heels, always and forever, nauseatingly in love with the male protagonist. 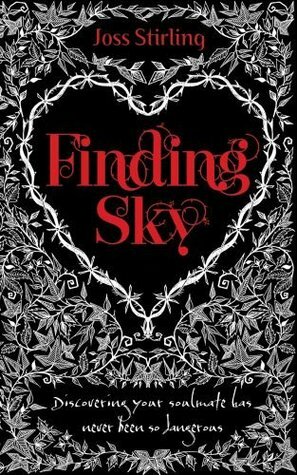 I loved that Sky fought to maintain her independence and did not immediately believe everything Zed told her. Sure, he's a sweet guy (... eventually), but that doesn't mean she has to lose herself in him! I hope more authors writing with a female audience in mind will pick up this trend in the future, as girls need more strong literary role models like Sky. I found the pacing to be a little off about 2/3 of the way through the book - after a major action sequence, Sky kind of goes off into la-la land for a little while. Though her state of mind was understandable, it was a little jarring to go from tension-action-drama to such a lull in the action. Another issue was the dialogue. The Americans did not sound at all authentic. I wish that authors would work with someone from whatever culture they're trying to write in order to make the dialogue sound more authentic! (Before anyone says anything, I am including American writers as well. I know how bad they sound trying to write non-American characters.) Honestly, though, these were the only issues I had with the book, and for the most part it's easy to gloss over them. I can't wait to read more from Joss Stirling! The sequel, Stealing Phoenix, will be out this fall - at least in the UK, you lucky ducks!